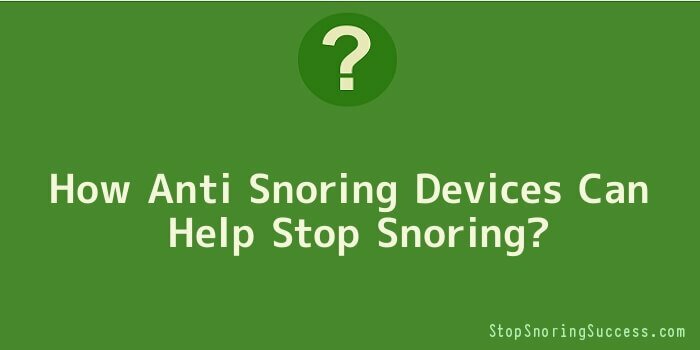 How Anti Snoring Devices Can Help Stop Snoring? A disturbance of some nature in the air passage, resulting in noisy vibrations of the throat, nose and mouth tissues, as well as in the soft palate, is commonly called ‘snoring’. Many anti snoring devices are found in the medical market to help alleviate the suffering of the listeners and of course, the perpetrator! Though the broad definition is that snoring is the result of an obstruction in any area between the larynx and nose end, discovering the reason for this block will enable you to find the right anti snoring device for your particular problem. The soft palate vibration or palatal flutter is a common cause in the snorer and the use of chin strips can eliminate its effects. The chin strip is an adhesive tape that pulls up the skin and muscles and prevents snoring by a simple process of keeping the mouth closed. The same application is useful for those who could be called ‘mouth breathers’ and snore only through their mouths. On the other hand, you could be a nose breather whose snoring arises from weak nasal muscles and collapsing nostrils which manifest largely during sleep. Both nasal strips and nasal dilators will usually work for you as a stop snoring cure. The nasal strip works in much the same way as the chin strip with the difference of being placed over the nose. Plastic bands in the adhesive attempt to straighten out, causing the sides of the nose to be pulled up leaving a widened nasal passage for the free flow of air. This method is popular with nose breathing snorers as it is a non prescription product as well as being drug free. The dilator prevents the collapse of the nostril. The latest in these anti snoring devices come in stainless steel and fit snugly into the nostril and prop up the nasal cavity for comfortable breathing. Once fitted for the night, a peaceful sleep is promised for all at home! These generally come with a cleaning bath. Unless you have complications like gum disease or uneven teeth, the Mandibular Advancement Device or MAD is probably the solution to your tongue based snoring. This anti snoring device keeps the tongue and lower jaw in a pushed forward position, giving more space for breathing easily during sleep. Sleep apnoea is a condition where incompetent breathing muscles will collapse during sleep and obstruct air from going in to the lungs. Those with Obstructive Sleep Apnoea will be suddenly woken up by the brain when it detects the respiratory arrest. This kick start generally happens with snore or snort. The Mandibular Advancement Device is a solution for mild to moderate sleep apnoea while anti snoring is achieved in more severe cases with a device known as the CPAP or ‘Continuous Positive Airway Pressure’. The newest advancements in technology have very small easy carry kits containing the headgear, hose, mask and machine which has to be hooked up for the night.